If you're looking for a medium-sized pickup with outstanding resale and build quality, the 2008 Honda Ridgeline may be just the ticket. A locking weather-resistant trunk positioned in the cargo bed floor is easily accessed via the dual-action tailgate, which flips down in the normal way or swings open like a door. 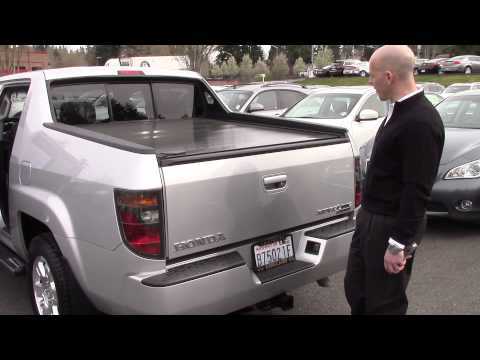 The 2008 Honda ridgeline has a trunk in the bed of the truck. I have a basic package ridgeline. It is very reliable but rides a little rough. It gets on average 18-21 mpg for gas. I have no special features. It has a trunk in the bed of the truck which is very nice for extra storage. The fabric in my truck seats is pour for showing stains. It is very easy to handle for driving a pickup. It is a nice mid-size vehicle. It holds 5 people. The back seat also folds up for hauling things inside the cab if needed. Multi use vehicle seats 5 adults comfortably. The Honda ridgeline is a very versatile vehicle that holds 5 adults comfortable and can haul a lawnmower at the same time. It also is an excellent vehicle to travel in winter conditions as it has a computerized traction control device that transfers energy and motion to the wheel that has the most traction. Also has a hidden trunk under the bed that is airtight, secures hidden things in a locked manner. 2008 Ridgeline - great all round choice. The ridgeline is an awesome vehicle that drives and rides like a car. It is the only truck that has a trunk(in the bed that is weatherproof. I pull a 20 foot proline center console boat and it has no issue with that weight. It has full time 4 wheel drive that is great in the rain or on dirt roads and the boat ramp. My only complaint is the lack of a Bluetooth system.